Before you Save or Export a PDF from Word using either a Mac or PC, it is VITAL to first verify and set the Page Size. If your file is not sized to match the book you'll be creating, you'll experience content distortion after uploading your file. This creates a Page Size Profile. Now when you export or Save As to create a PDF, the page size will be retained. If you do not create a page size profile in Word, the PDF you create may be resized to the default size (generally 8.5x11). Please Note: Using Microsoft Word for Mac to create a PDF utilizes Mac's Quartz PDF creator, which can cause issues with printing. Word offers two methods to create a PDF. You can Save As and export a PDF or you can perform a 'Print to PDF' to use our Job Options settings. Please Note: Using Word's Save As to create a PDF utilizes Mac's Quartz PDF creator, which can cause issues with printing. Select PDF from the "File Format" drop down. Check the box for "Best for Printing" then export to PDF. Creating a PDF with Word's print menu ensures your PDF will meet our minimum print requirements. The first step is to download and unzip the Job Options file (attached at the bottom of this page). Please Note: Print to PDF using Lulu's Job Options will only be available if your Mac has Adobe Pro and/or Adobe Distiller installed. 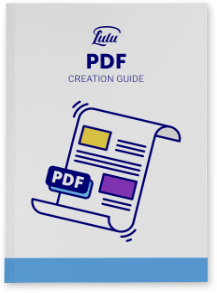 The PDF will be created using Lulu's Job Option specifications. Creating a PDF using our specifications will embed fonts and apply basic presets for making your file print ready. If you use a PC, creating a PDF from Word can be done in much the same way - using either the 'Save As' option or the 'Print to PDF' option. The other option is to print direct to PDF. This allows you to apply our Job Options and helps ensure that the file can be made print ready. Please Note: Print to PDF using Lulu's Job Options will only be available if your PC has Adobe Pro and/or Adobe Distiller installed.